Anemia affects more than 30 percent of the world's population, and it is one of the most important worldwide health problems. It has a significant prevalence in both developing and industrialized nations. Causes of anemia include nutritional deficiencies , particularly of iron , vitamin B 12 , and folate (folic acid); excess blood loss from menstruation or chronic illness and infection; ingestion of toxic substances, such as lead, ethanol, and other compounds; and genetic abnormalities such as thalassemia and sideroblastosis . Anemia is caused by a deficiency in the intake and absorption elements required to make red blood cells. The condition is defined as one in which the blood is deficient in red blood cells, in hemoglobin , or in total volume. This results in blood that is incapable of meeting the oxygen needs of the body's tissues. Anemia is characterized by changes in the size and color of red blood cells. Red blood cells, or erythrocytes, are primarily responsible for oxygen transport from the lungs to the body's many cells. Hemoglobin is an oxygen-carrying protein in the red blood cell that incorporates iron into its structure. Therefore, iron is an essential building block of blood erythrocytes. When red blood cells are larger than normal, the anemia is termed macrocytic, and when they are smaller than normal, it is called microcytic. Normal red cell color is termed normochromic, and if the red cells appear pale, the anemia is called hypochromic. When extensive lab testing is not available for diagnosis, the use of a portable colorimeter can be used to detect anemia. Anemia in the developing world is most commonly caused by an iron deficiency, which affects up to 50 percent of the population in some countries. Iron deficiency not only impairs the production of red cells in the blood, but also affects general cell growth and proliferation in tissues like the nervous system and the gastrointestinal tract. Red cells in a patient with iron-deficiency anemia are both microcytic and hypochromic. Iron deficiency affects young children, adolescents, and women of reproductive age—three periods of rapid growth during which the body's iron needs are higher than normal. In children, iron requirements are highest between the ages of six and eighteen months, and can be ten times the requirement of a normal adult. Iron is commonly absorbed from both human milk and cow's milk, and, if consumed in good quantities, these sources can meet the body's iron needs. A deficiency can result from inadequate intake, or it can occur if milk remains the sole source of a child's nutrition after the age of four months, when iron needs exceed that provided by milk alone. Research in Chile has shown that 40 percent of children whose main source of nutrition was breast milk developed iron-deficiency anemia. Such children can appear tired and inattentive, and they can suffer from delayed motor development. Some children can even develop mild to moderate mental retardation as a result of iron-deficiency anemia. Recent research has shown that iron-deficiency anemia can also contribute to emotional development problems, with malnourished children acting more irritable and fussy. Pregnant women can have up to double the requirement of iron for a normal adult, with the majority of the mother's iron being transferred to her growing fetus. Adult diets in most of the developing world tend to be iron-poor, and a low dietary intake can result in iron deficiency. Deficiency can also occur as a result of poor iron absorption due to gastrointestinal pathology, blood loss due to normal menstruation, blood loss from parasitic infections such as hookworm and malaria , and blood loss from chronic diarrhea—all of which are common in developing countries. The two other primary causes of nutritional anemia are deficiencies in vitamin B 12 and folic acid, both of which are necessary for the production of DNA , RNA , and protein. Without these necessary factors, red blood cells can develop abnormally, or even die prematurely in the bone marrow where they are made. This leads to what is known as megaloblastic anemia. Folate deficiency is most often caused by poor intestinal absorption or low intake of folate-rich foods, such as human milk, cow's milk, fruits, green vegetables, and certain meats. It is also caused by congenital defects in intestinal absorption. Just as with iron, folic acid requirements are highest during periods of rapid growth, particularly infancy and pregnancy. 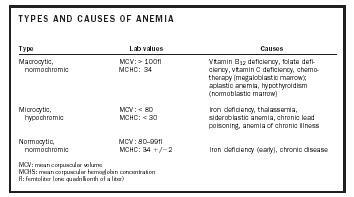 Folate-deficient children present with common symptoms of anemia, as well as chronic diarrhea. Folate deficiency can also occur with kwashiorkor or marasmus . If it occurs during pregnancy, folate deficiency can lead to neural tube defects, spontaneous abortions, and prematurity. Vitamin B 12 , derived from a substance called cobalamin, is mainly found in meats and other animal products—humans cannot synthesize this vitamin on their own. A good amount of its absorption depends on the presence of a substance called intrinsic factor (see sidebar). It does not normally occur with kwashiorkor or marasmus. Both folate and vitamin B 12 deficiencies have also been linked to cardiovascular disease, mood disorders, and increased frequency of chromosomal breaks (which may contribute to the development of cancer ). Pernicious anemia is a common cause of cobalamin/vitamin B 12 deficiency. It is primarily a disease of the elderly and caused by an abnormality in the immune system where the body creates antibodies to intrinsic factor (a substance that facilitates absorption of vitamin B 12 ) or to the cells in the stomach that secrete it. The lack of intrinsic factor B 12 leads to vitamin B 12 deficiency. It can also be caused by physiologic or anatomic disturbances of the stomach that might prevent intrinsic factor secretion. In children, an atypical and rare form of pernicious anemia can be inherited. It is an autosomal recessive disorder that results in an inability to secrete intrinsic factor, and it presents with anorexia, weakness, a painful red tongue, and neurologic abnormalities. Each of the important causes of nutritional anemia can be eradicated through prevention and treatment. Many countries have begun this process by instituting food supplementation programs in which grains and cereals are fortified with iron, folate, or vitamin B 12 . Given adequate resources, these deficiencies can also be ameliorated with direct oral supplements of absorbable iron, vitamin B 12 , and folic acid. Injectable forms of iron are also available. It has been found that the supplementation of vitamin A to at-risk populations improves anemia more efficiently than iron supplementation alone. Treatment plans must also focus on the causes of anemia and therefore must include sanitation, treatment of infections such as malaria and HIV, and, most important, treatment of intestinal parasites . Much work is needed to address general malnutrition —not only concerning these deficiencies, but also other commonly occurring ones (e.g., vitamin A, zinc , copper, calcium ). Programs dedicated to decreasing the rates of infection and illness in developing countries—through health education, immunization, sanitation, and appropriate treatment—will also contribute to a lower incidence and prevalence of worldwide anemia. SEE ALSO Kwashiorkor ; Malnutrition ; Marasmus ; Nutritional Deficiency ; Vitamins, Water Soluble . Behrman, Robert E.; Kliegman, Robert M.; and Jenson, Hal B., eds. (2000). Nelson Textbook of Pediatrics, 16th edition. Philadelphia, PA: W. B. Saunders. Hoffbrand, A. V., and Herbert, V. (1999). "Nutritional Anemias." Seminars in Hematology 36(4). Isselbacher, Kurt J. (1994). Harrison's Textbook of Internal Medicine, 13th edition. New York: McGraw-Hill. Pollitt, E. (2000). "Developmental Sequela from Early Nutritional Deficiencies: Conclusive and Probability Judgments." Journal of Nutrition 130. Ramakrishnan, U., ed. (2001). Nutritional Anemias. Boca Raton, FL: CRC Press. Rhoades, R. A., and Tanner, G. A. (1995). Medical Physiology. Boston: Little Brown. Yip, R., and Ramakrishnan, U. (2002). "Experiences and Challenges in Developing Countries." Journal of Nutrition 132.